Psycho Solo Diver – Online Diving Blog and more! 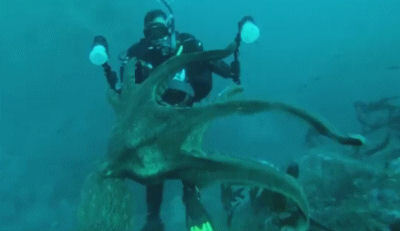 » Diver In Life And Death Struggle With Giant Octopus! 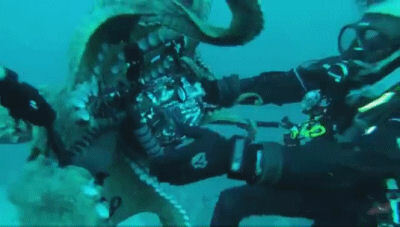 Diver In Life And Death Struggle With Giant Octopus! Last month, Warren Murray and David Malvestuto were making a SCUBA dive in 80 feet at Bluefish Cove in Carmel, California, when they came across a giant octopus that are usually found at depth. Maybe the giant octopus swam to shallower waters in an attempt to find food? Both started taking pictures of the giant sea creature when the giant octopus lunged towards David. David was suddenly and deliberately attacked by the huge cephalopod mollusc. In a scene that looked like an underwater tourist fending off an eight-armed crack addicted thug, David made a life and death struggle with the giant octopus as it tried to steal his camera. Maybe the giant sea creature became afraid of the flashes, or maybe just became fatigued, but eventually the monster let go and retreated. Luckily, David’s diving buddy Warren, captured the struggle on his camera. I like your National-Enquirer-like version of the same story I read last week.